The definition of biodegradable is simple: It means an item that can break down into natural materials in the environment without causing harm. For example, when a substance biodegrades into carbon dioxide, water, and other naturally occurring minerals, the substance seamlessly mixes back into the earth, leaving no toxins behind. Many materials do break down in a more harmful manner, leaving chemicals or other harmful substances in the soil. 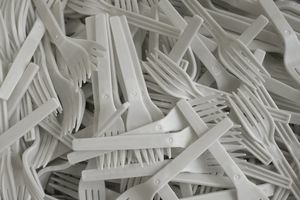 In terms of environmental benefits, a biodegradable material will break down quickly rather than taking years. It leaves nothing harmful behind and saves landfill space. Unfortunately, not everything that's advertised as "biodegradable" actually breaks down. Some items are obviously biodegradable — examples include food scraps and wood that hasn't been treated with chemicals to resist bugs and rot. Other items also may biodegrade relatively easily, such as paper. Some products will biodegrade eventually, but it may take years. This includes steel products, which eventually will rust through and disintegrate, and some plastics. However, conditions are important to encourage biodegradability. Products that will biodegrade in nature or in home compost heaps may not biodegrade in landfills, where there's not enough bacteria, light, and water to move the process along. Many organic companies use biodegradable packaging for products or produce organic biodegradable products, but the items may not be as biodegradable as customers think. Major misconceptions surround the differences between compostable and biodegradable packaging and products. Compost-friendly items include organic matter that easily breaks down, while biodegradable items are capable of decomposing at some point but usually need help from biological agents such as bacteria to do so. Some real biodegradable products usually need to be degraded in a controlled composting environment or facility — and very few of these facilities exist in the United States. A controlled facility simply means a large facility where materials reach 140 degrees F for 10 consecutive days. According to standards developed by the Biodegradable Products Institute, PLA, a popular biodegradable material for green companies, will only decompose into carbon dioxide and water in a “controlled composting environment,” not in a backyard composting arrangement. California tends to have more stringent regulations involving food and product environmental claims (hence the warning labels stating items have been "found by the State of California to cause cancer, birth defects or other reproductive harm"). When it comes to biodegradable claims, the state also is out in front with regulations limiting the use of certain terms. In California, it's illegal to sell any plastic item, or any item with plastic packaging, that includes a label stating it's "biodegradable," "degradable," "decomposable," "compostable" or "marine degradable" (or any alternate form of those terms). It's also illegal in the state to sell a plastic product labeled "home compostable" (or some equivalent claim) unless the manufacturer holds a Vincotte OK Compost Home certificate. Vincotte is a Belgium-based inspection and certification organization. Finally, the state bans the use of potentially misleading marketing terms, such as "environmentally friendly," when they're applied to plastic products and packaging.